It’s almost impossible to watch Sierra Pettengill and Pacho Velez’s found-footage docu-essay The Reagan Show without thinking about the White House’s current occupant. The connections are intentional. 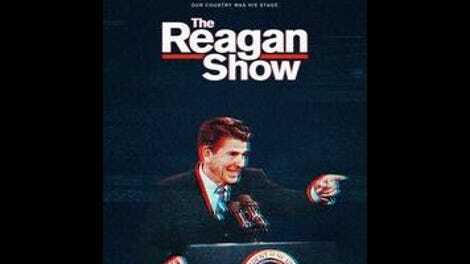 Pettengill and Velez constructed The Reagan Show entirely from old media coverage of Ronald Reagan, using interviews, punditry, and amusing flubs and outtakes to paint a picture of a presidency that traded on the celebrity of its chief executive to sell simple, reactionary ideas about taxes, social welfare programs, and national defense to fiercely devoted supporters. In the opening minutes, the film even has a clip of President Reagan speaking to backers about his vision for the country, and promising, “Together, we’ll make America great again.” The message is clear: The voters just elected a man who invoked nostalgia for a man who invoked nostalgia. But it’d be wrong to think of The Reagan Show as some kind of a takedown of its subject. (Or at least the subject in its title; as an extended, subtle dig at President Donald Trump, it’s more devastating.) If anything, the movie has a refreshing “’twas ever thus” quality. Only the most partisan viewer could walk away from The Reagan Show without imagining that Pettengill and Velez could just as easily have made The Bush Show, The Clinton Show, The Obama Show, or The Bush Show Part II. The obsessively stage-managed photo-ops, the inadvertently damning off-the-record comments, the constant nettling of the press: Nothing much has changed since 1980, save for the capabilities of the people in the Oval Office. The filmmakers probably couldn’t have made The Carter Show or The Nixon Show, though, because one of the key observations in this documentary is that Reagan and his team reinvented the White House communications operation. The movie opens with the president doing an end-of-second-term interview with David Brinkley, where he admits, “There have been times in this office when I wondered how you could do the job if you hadn’t been an actor.” The most remarkable behind-the-curtain moments in The Reagan Show reveal the old Hollywood pro fussing over small details, from whether or not his guests at press conferences are standing close enough to the microphone to whether Nancy Reagan looks engaged enough during photo shoots. 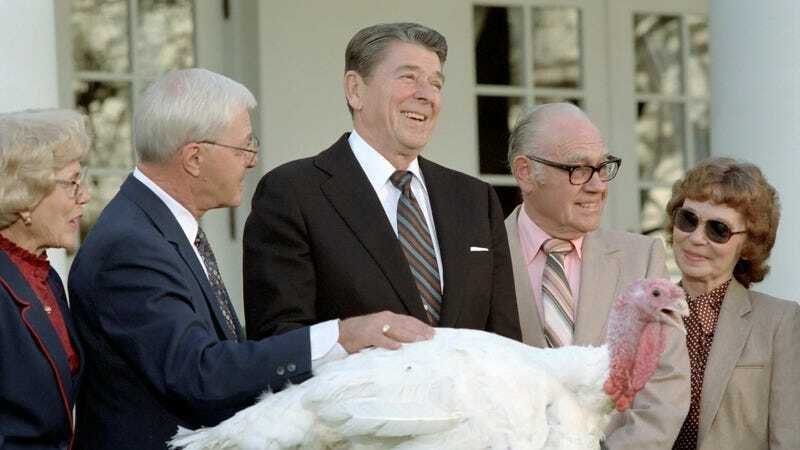 Reagan’s staff were keenly focused on putting out a single, unified message to the press each day, and they orchestrated the president’s schedule so that he’d be seen interacting with people and locations that reinforced their agenda. But Reagan himself wasn’t a passive participant in the strategy. As seen in this film at least, he had plenty of his own good ideas about stagecraft. The Reagan Show isn’t just about documenting how much the president and Mrs. Reagan thought about their public image. Much of the movie considers how that aspect of the administration carried over into some of its most high-pressure moments—including the Iran-Contra scandal and the arms-reduction negotiations with Mikhail Gorbachev. When the Communist Party’s reform-minded new general secretary took office in 1985, he captured the imagination of the global media, and challenged Reagan’s reputation as a morally righteous warrior against a rampaging “evil empire.” Some of the more revealing moments here show Reagan, thinking he’s off-camera, grumbling about how Gorbachev appears to be winning the propaganda war. There’s a lot in The Reagan Show that could be considered flattering to the president, too—especially for viewers in 2017, who now know what some of the alternatives to Reagan can be. The film shows him eloquently quoting great writers, and standing up against members of his own party to push for his treaty with the Soviet Union. And it also puts well-known Reagan moments like the “tear down this wall” speech into a larger political context. Even people who lived through the Reagan years may be jolted by some of the details in The Reagan Show—from Lee Greenwood performing the then-new “God Bless The USA” in front of the president at the 1984 Republican National Convention to the way that the TV movie The Day After affected both the public conversation and the administration’s policies regarding nuclear weapons. What may be most eye-opening to modern audiences is how openly critical the mainstream media was at the time, as anchors and commentators—many of whom would later frame Reagan as the kind of strong, wildly popular leader that the country needs—spent part of their airtime questioning the president’s stamina, and noting the tricks the administration used to manipulate the public. Even the way the reporters shout questions (a necessity, due to the intentionally awkward logistics of press availabilities) made them sound every bit like the obnoxious enemies of earnest American patriotism that right-wing media-bashers say. Mostly, though, this movie is meant to make audiences reflect on the legacy of the Reagan approach to presidential theater, which was designed to put the man and his ideas on the news every night, presented just so. It’s an approach that works well when the audience enjoys the company of this person who’s become a permanent fixture on their TV. But it’s also one that enrages opposing voters, who can only ever see the maddening fakery.